The PLA floating crane LONDON LEVIATHAN in Tilbury. The self-propelled crane barge LONDON LEVIATHAN (1075 tons gross), was built at Amsterdam in 1965 and was owned by the Port of London Authority. In 1993, it was sold to Reed Heavy Lift Marine II Ltd, and four years later to Woodstock Maritime Corp, and was registered in Belize. 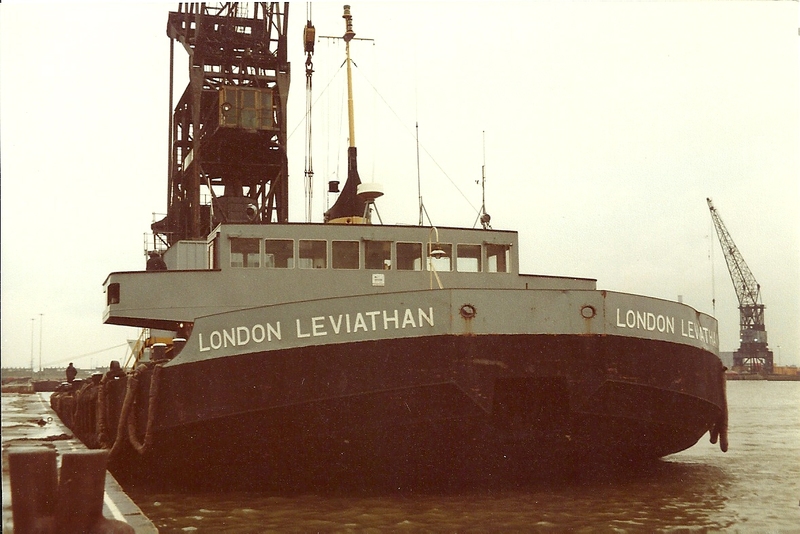 It spent the past few years of its known career in the Caribbean region, where, in 1999, it was renamed LEVIATHAN, owned by Inter Isle Construction & Fabrication Co Ltd, of Port of Spain, Trinidad and Tobago. It remained there in 2005 when sold to Leviathan Marine Services Ltd. There have been no reports of the vessel for over five years and its continued existence as a crane barge is in doubt.